Who loves graphic tees? I know I do! They are so fun and trendy. I love how you can wear them with almost anything. 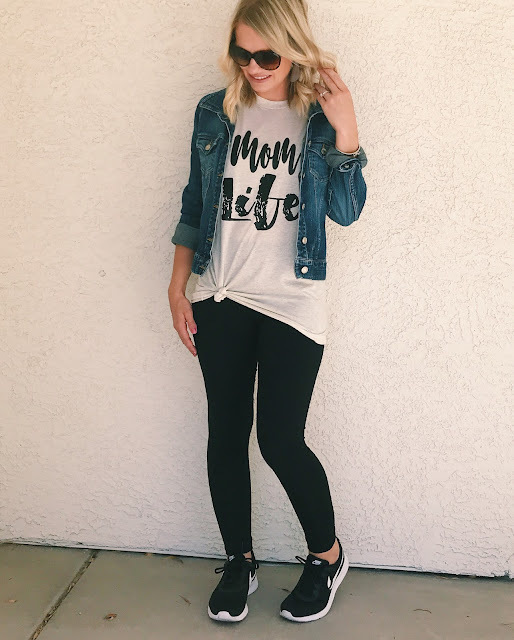 They are perfect to wear when working out, running errands or just being lazy around the house. I feel like you can throw on a graphic tee with any bottoms and instantly have on a cute outfit without even trying. *This post is part of a collaboration with Top Crate. As always my opinions are 100% my own. This post also includes affiliate links. By making a purchase through a link, I will make a commission for this blog. Thank you for your support! I was recently contacted by Top Crate to see if I wanted to try out some of their t-shirts. I don't say yes to every opportunity that comes my way, but when I saw their selection of graphic tees, I immediately said yes. Top Crate has a graphic T-shirt for everyone. From holiday theme shirts to food theme shirts, they have them all. You can never have enough graphic tee's and that's why Top Crate is perfect for graphic t-shirt lovers. They have a subscription box that you can sign up for. You will receive a box every month with 2 t-shirts that fit your personality and lifestyle. You can chose to sign up for 3 months, 6 months or 1 year. I always love a company that gives back, so I was happy to see that for every subscription box, Top Crate donates a T-shirt to a local women's shelter. You can read more about Top Crate HERE! I easily found 2 shirts at Top Crate that fit my personality and lifestyle. The first one is the Mom Life shirt. 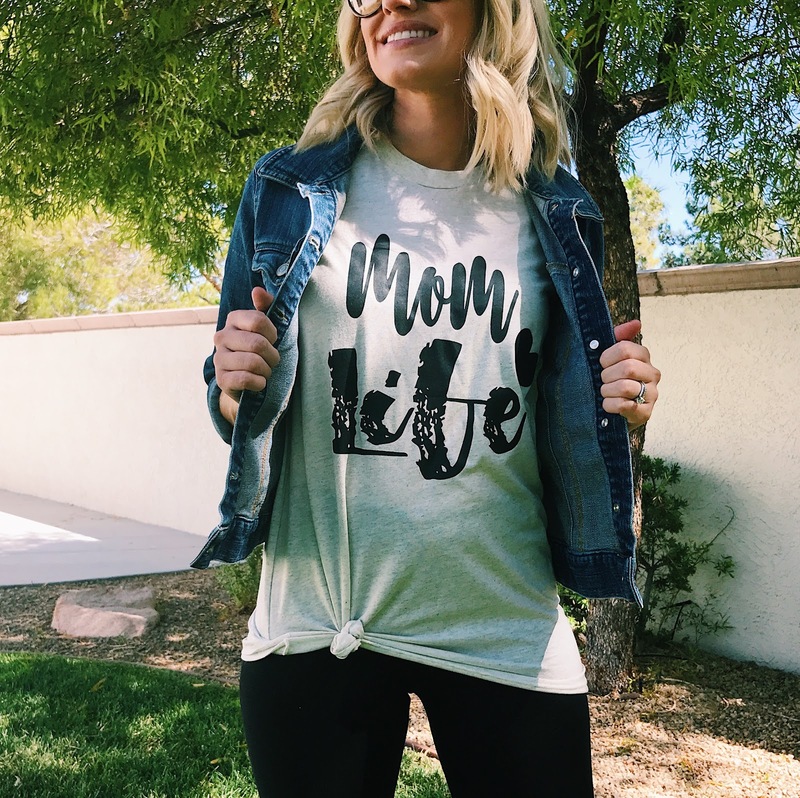 This shirt says it all. I decided to were it with a "mom life" outfit. This is my new errand running outfit for fall. My next t-shirt is from Top Crate's Fall collection. Thankful and Blessed. I love how simply stated this shirt it. I think this shirt is the perfect shirt to wear around Thanksgiving. I can't wait to pair it with a cute plaid button down as the weather cools off. One thing I forgot to mention about these T-shirts is how comfortable the material is. The shirts are a nice quality, light weight and they fit perfectly. I went with a small and it fits very true to size. I'm so excited for all of you, because Top Crate wants to share one of their T-shirts with you! 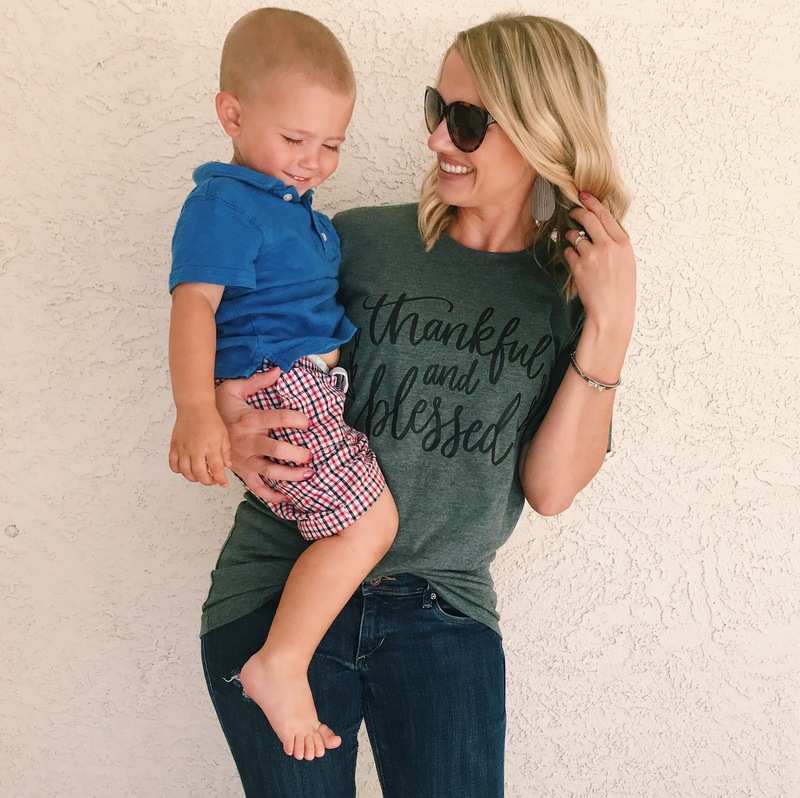 You can go to my Instagram post HERE, and enter to win the Thankful and Blessed T-shirt that I'm wearing above. It's really easy to enter, so I hope you will take a minute and enter!